municipal services, in a financially responsible manner. There is an official agenda for every meeting of the City Commissioners, which determines the order of business conducted at the meeting. The City Commission will not take action upon any matter, proposal, or item of business, which is not listed upon the official agenda, unless a majority of the Commission has first consented to the presentation for consideration and action. Consent Agenda Items: These are items which the Commission does not need to discuss individually and which are voted on as a group. Voice Vote: A voice vote by the Commission indicates approval of the agenda item. This can be by either a regular voice vote with "Ayes & Nays" or by a roll call vote. The public is encouraged to offer comment to the Commission at their meetings during Public Hearings, Public Audience, and on any regular agenda item, as hereinafter described. City Commission meetings are business meetings and, as such, the Commission retains the right to impose time limits on the discussion on an issue. Public Hearings: Any citizen may speak on an official agenda item under the section entitled "Public Hearings." When addressing the Commission, please step up to either podium and state, for the record, your name and address. Any person who disputes the meeting while addressing the Commission may be ordered by the presiding officer to cease further comments and/or to step down from the podium. Failure to discontinue comments or step down when so ordered shall be treated as a continuing disruption of the public meeting. An order by the presiding officer issued to control the decorum of the meeting is binding, unless over-ruled by the majority vote of the Commission members present. Please turn off all pagers and cellular phones in the City Commission Chambers while the City Commission Meeting is in session. City Commission meetings are held in the Boynton Beach City Commission Chambers, 100 East Boynton Beach Boulevard, Boynton Beach. All regular meetings are held typically on the first and third Tuesdays of every month, starting at 6:30 p.m. (Please check the Agenda Schedule - some meetings have been moved due to Holidays/Election Day). Comments by Fred Barch, Principal of Boynton Beach Community High School. A. Announce Farm Share Free Food Distribution in partnership with State Representative Lori Berman and City of Boynton Beach Commissioner Joe Casello on Saturday, January 28, 2017 from 9am - 12pm at St John's Missionary Baptist Church. B. Announcement by Recreation & Parks Director Wally Majors about the Football Field Scoreboard Ceremony at Hester Park, which will be at the football field on Saturday, January 21, beginning at 4:00 p.m.. The International Kinetic Art Exhibit and Symposium, February 3-5, 2017 in the Cultural District of east Boynton Beach. Friday, February 3rd - Opening Reception 6-8pm, this is by invitation only. Proclaim Tuesday, February 7, 2017 as Robert E. Wells Day. A. PROPOSED RESOLUTION NO. R17-005 - Authorize the City Manager to sign an Interlocal Agreement between the Northern Palm Beach County Improvement District and the City of Boynton Beach for the City's stormwater National Pollutant Discharge Elimination System (NPDES) Fourth Cycle Permit. PROPOSED RESOLUTION NO. R17-006 - Authorize the City Manager to sign a Lease and Easement Agreement with Florida Power & Light (FPL) to enable installation of a Solar Tree at Boynton Beach Oceanfront Park. C. PROPOSED RESOLUTION NO. R17-007 - Authorize the City Manager to execute all documents associated with the Florida Recreation Development Assistance Program (FRDAP) grant that was awarded to the City for the purchase and installation of a multi-purpose, accessible playground at Barrier Free Park and other related improvements, accept the grant and execute the Grant Agreement subject to the approval of the City Attorney. D. PROPOSED RESOLUTION NO. R17-008 - Approve and authorize the City Manager to sign an Agreement for Water Service outside the City limits with James M Colby and Sherry A Colby for the property at 1101 Peak Road, Lantana, FL 33462. E. PROPOSED RESOLUTION NO. R17-009 - Approve and authorize the City Manager to sign an Agreement for Water Service outside of the City limits with Angela Edythe Erb and Ross A Caranci for the property at 7089 Lawrence Road, Boynton Beach, FL 33436. F. PROPOSED RESOLUTION NO. R17-010 - Approve and authorize the City Manager to sign an Agreement with Florida Atlantic University Board of Trustees, on behalf of The John Scott Dailey Florida Institute of Government at Florida Atlantic University of Boca Raton, FL to review and update the City's Strategic Plan in the amount of $16,297. G. Approve the list of top ranked qualifiers as determined by the Evaluation Committee from the submissions received in response to the "Request for Qualifications for Professional Survey and Mapping Services"; RFQ No. 067-2821-16/TP and authorize City Staff to conduct negotiations for compensation with the recommended qualifiers according to Florida State Statute 287.55, Consultants' Competitive Negotiation Act (CCNA). H. Approve the list of top ranked qualifiers as determined by the Evaluation Committee from the submissions received in response to the "Request for Qualifications for Cured-In-Place Pipe (CIPP) Lining, RFQ No. 057-2821-16/TP, as pre-qualified Contractors with the skills, experience and requisite products needed to successfully perform Cured-In-Place Pipe Lining. I. Approve the one-year extension for RFPs/Bids and/ or piggy-backs for the procurement of services and/or commodities as described in the written report for January 17, 2017 - "Request for Extensions and/or Piggybacks". J. Accept the written report to the Commission for purchases over $10,000 for the month of December 2016. K. Approve the minutes from the Regular City Commission meeting held on January 3, 2017. PROPOSED RESOLUTION NO. R17-011 - Authorize utilizing National Intergovernmental Purchasing Alliance (Natl IPA) contract #151089 "Body Worn Cameras and Storage System" and authorize the City Manager to sign a Master Services and Purchasing Agreement and any related documents to purchase body worn cameras and a five (5) year subscription with Evidence.com for the storage of all video related to the body worn cameras, subject to the City Attorney's review and approval. The National IPA contract was competitively bid by the City of Tuscon, AZ and satisfies the City's competitive bid requirements. Requesting Commission approval to utilize $49,737.92 for the cost of the cameras (including shipping) from the Federal Forfeiture Law Enforcement Trust Fund. The five (5) year subscription of Evidence.com for unlimited storage cost is $512,046 to be paid from the departmental budget. Approve a one-year renewal for the "ANNUAL SUPPLY OF SODIUM HYDROXIDE (LIQUID CAUSTIC SODA) Bid No. 025-2821-15/JMA to Brenntag Mid-South Inc. of Orlando, FL with a $45.00 per ton increase from $498 per ton to $543 per ton. This product will be ordered on an "As Needed" basis for the estimated annual expenditure of $150,000. The City Commission will conduct these public hearings in its dual capacity as Local Planning Agency and City Commission. A. PROPOSED RESOLUTION NO. 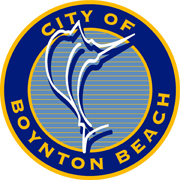 R17-012 - Authorize the Mayor to sign an Interlocal Agreement between the City of Boynton Beach and Boynton Beach Community Redevelopment Agency (CRA) for the CRA funding of a Community Standards Outreach Coordinator for FY 16/17 for an amount not to exceed $134,000. B. Accept the ranking of the proposers as determined by the Evaluation Committee for the Request for Qualifications for Town Square Redevelopment, RFQ No. 004-1210-17/JMA. The Committee also recommends that the Commission request the three (3) top ranked submittals be moved onto Part II of the process. C. Discussion of Denson Pool Hours of Operation. Vice Mayor McCray requested this discussion item be placed on the agenda. A. PROPOSED ORDINANCE NO. 17-001 - SECOND READING - Approve Riverwalk Future Land Use Map amendment (LUAR 16-003) from Local Retail Commercial (LRC) to Mixed Use Core (MX-C). Agent: Steven S. Wherry of Greenspoon Marder, P.A. for Shaul Rikman of Isram Riverwalk, LLC, property owner. B. PROPOSED ORDINANCE NO. 17-002 - SECOND READING - Approve Riverwalk Rezoning (LUAR 16-003) from C-3 (Community Commercial District) to MU-4 (Mixed Use 4 District) with a master plan for 326 apartments, 51,220 square feet of commercial space, public waterfront promenade, and related site improvements on 9.78 acres. Agent: Steven S. Wherry of Greenspoon Marder, P.A. for Shaul Rikman of Isram Riverwalk LLC., property owner. C. Approve request for Riverwalk Plaza (CDPA 16-002) Community Design Plan Appeal of Chapter 2, Article III, Section 4.B.3, “Build-to-line”, requiring buildings along Woolbright Road to be constructed within a build-to-line of 0 to 15 feet to allow a setback of 139 feet. Applicant: Shaul Rikman, Isram Riverwalk, LLC. (TABLED TO JANUARY 17, 2017 SO THAT FINAL ACTION OCCURS ON THE SAME DATE AS ACTION TAKEN ON THE CORRESPONDING APPLICATION ITEMS). F. PROPOSED ORDINANCE NO. 16-025 - SECOND READING - Adoption of an Ordinance establishing a Moratorium for a period from December 6, 2016, to June 4, 2017 regarding group homes. PROPOSED ORDINANCE NO. 17-003 - SECOND READING - Approve Ordinance prohibiting "Conversion Therapy". H. PROPOSED ORDINANCE NO. 17-004 - FIRST READING - First Reading. Approval of ordinance limiting future cemetery use to City residents. Consider adopting a Chronic Nuisance Ordinance - February 2017. Pursuant to Section 286.011(8), Florida Statutes, the City has scheduled a private attorney-client session to discuss pending litigation - February 7, 2017, 6:00pm. The Commission meeting on Tuesday, March 7, 2017 has been rescheduled to Monday, March 6, 2017 at 6:30p.m. in the Commission Chambers due to members of the Commission travelling to Tallahassee on March 7, 2017. Joint City Commission/CRA Workshop for six month update on 2016 strategic plan at the Intracoastal Park Clubhouse (IPC) at 3:30p.m. - March 28, 2017. F. Discuss an amendment of the City's Zoning Regulations (LDR Chapter 3, Section 3.D.) to allow medical offices as accessory uses to a residential development. - February 7, 2017. G. Discuss the creation of a citizen oversight committee as provided by Palm Beach County ordinance and Interlocal agreement - February 7, 2017. THE CITY SHALL FURNISH APPROPRIATE AUXILIARY AIDS AND SERVICES WHERE NECESSARY TO AFFORD AN INDIVIDUAL WITH A DISABILITY AN EQUAL OPPORTUNITY TO PARTICIPATE IN AND ENJOY THE BENEFITS OF A SERVICE, PROGRAM, OR ACTIVITY CONDUCTED BY THE CITY. PLEASE CONTACT THE CITY CLERK'S OFFICE, (561) 742-6060 OR (TTY) 1-800-955-8771, AT LEAST 48 HOURS PRIOR TO THE PROGRAM OR ACTIVITY IN ORDER FOR THE CITY TO REASONABLY ACCOMMODATE YOUR REQUEST. ADDITIONAL AGENDA ITEMS MAY BE ADDED SUBSEQUENT TO THE PUBLICATION OF THE AGENDA ON THE CITY'S WEB SITE. INFORMATION REGARDING ITEMS ADDED TO THE AGENDA AFTER IT IS PUBLISHED ON THE CITY'S WEB SITE CAN BE OBTAINED FROM THE OFFICE OF THE CITY CLERK.